United℠ Explorer Business Card: Should You Apply? An excellent credit card for businesses that frequently find themselves flying with United. Plenty of good perks and features to to reward those loyal to the airline. The United℠ Explorer Business Card is an excellent airline credit card for those who frequently fly with United. This card provides plenty of opportunities to earn extra miles through bonuses and purchases you charge to it, and it tops that all off with very good flight-specific perks, including priority boarding. However, if you value flexibility over loyalty to United, you will likely get a better value out of generic travel rewards or cash back business cards. The United℠ Explorer Business Card is a good option for businesses owners who frequently find themselves having to travel with the card's affiliated airline. If you have no particular loyalty to United, however, and if you don’t care about earning any airline-specific benefits, we recommend going with a more generic business credit card, like the Ink Business Preferred℠ Credit Card or Capital One® Spark® Cash for Business. While you may get slightly lower value by choosing a more generic travel rewards card, you may earn rewards and benefits that will be more immediately put-to-use for your business. Consider this when choosing the right card for your firm. The best features of the United℠ Explorer Business Card are those tied to flying with United. Cardholders can get their first checked bag fee waived, priority boarding, and two United Club℠ passes each year. This is where the core of this card’s value lies. However, unless you are traveling with United frequently throughout the year, these are unlikely to match the value you'd otherwise get out of focusing on purely earning rewards with another card. On the small business side of things, this card checks off all the core benefits you’d expect. You can issue employee cards at no additional cost, set individual spending limits and monitor their spending. However, don’t expect your United-benefits, like priority boarding, to extend to these additional cards. Those only apply to the primary cardholder. Bottom Line: The United℠ Explorer Business Card is a good credit card for any businesses that frequently travels with its co-branded airline, United. Unless you find yourself on two United flights or more each year, however, you should look at other options. 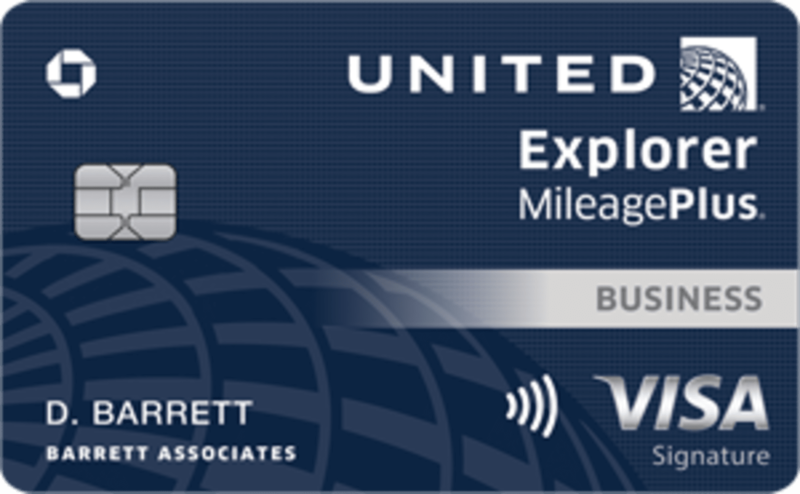 The United℠ Explorer Business Card provides you with 2X miles on business purchases in select categories and 2X miles per dollar on purchases from United. The select business categories include restaurants, gas stations, and office supply stores. You will only receive the 2x miles on United purchases when you book tickets directly from the airline. Additionally, for a limited time you’ll receive a bonus 50,000 miles after you spend $3,000 on purchases in the first 3 months your account is open. Note that the miles you receive for United purchases are added on top any miles you’d normally receive for booking a ticket. The United℠ Explorer Business Card currently awards a 50,000-mile bonus to those who spend at least $3,000 on purchases in the first 3 months their account is open. We value a single United mile at about 1.2 cents for economy seating and 1.5 cents for business class seating. Therefore, this bonus can be worth anywhere between $900 and $1100. The $3,000 requirement can only be met through purchases. Other transactions, including cash advances or balance transfers, do not count towards the minimum. The primary cardholder and one traveling companion are entitled to have their first standard checked bag fee waived. The first checked bag on a United flights costs $25. Therefore, those who are travelling with at least one other person can save up to $100 per round-trip flight. That would be enough to cover the card's annual fee. Additionally, United℠ Explorer Business Card users also receive a priority boarding benefit, so long as they provide their MileagePlus® number on their reservation. You will be able to board the plane after MileagePlus Premier® members, customers with Premier Access® and travelers requiring special assistance. Both of these benefits are available only on United®- and United Express®-operated flights. Codeshare flights are not eligible for the free checked bag or priority boarding benefits. These perks are also only for the primary United℠ Explorer Business Card users. If you have an employee card, the primary cardholders must be on the same reservation for the features to kick-in. Every cardmember anniversary, the primary account is awarded two United Club℠ passes. These passes normally cost $59 each. Therefore, together this benefit is worth $118 annually. United Clubs℠ are airport lounges that can be beneficial to business travelers. They provide Wi-Fi, personalized travel assistance, beverages, breakfast and snacks. If you’re frequently flying with United for business, this can be a much-needed perk, especially if you’re looking to get work done on the road. These lounges can provide you with a quiet working area. Note that the pass only admits one attendee. If you are travelling with a coworker, they will need their own pass to get in. You can use both the passes during the same trip so that the two of you may enter at the same time. How Does The United℠ Explorer Business Card Compare To Other Small Business Credit Cards? To give you a better idea of the value of the United℠ Explorer Business Card we compared it across a couple other small business credit cards. When shopping for a card, you should always consider multiple options to make sure you are getting the best deal possible. The Ink Business Preferred℠ Credit Card is the better card for businesses that aren’t loyal to one particular airline. The card awards 3 points per $1 on the first $150,000 spent in combined purchases on travel, shipping purchases, Internet, cable and phone services, and on advertising purchases made with social media sites and search engines each account anniversary year. All other purchases get you just 1 point per dollar. This reward structure provides you a significantly higher rewards rate than what you get with the United℠ Explorer Business Card – all while charging you a similar annual fee. However, the Ink Business Preferred℠ Credit Card is missing some of the United-specific benefits you get with the United℠ Explorer Business Card, including free first checked bags, priority boarding and United Club passes. This may be a big deal if your company exclusively travels with United. The points you earn through the Ink Business Preferred℠ Credit Card, called Chase Ultimate Rewards points, can be traded in for points and miles at participating hotel and airline programs, including United MileagePlus® and Southwest Airlines Rapid Rewards®. The Capital One® Spark® Cash for Business is a less expensive solution best suited for businesses with very varied spending needs. The card offers an unlimited 2% cash back rate on all your purchases, no matter the category. While the United℠ Explorer Business Card will give you better returns on United, restaurant, gas and office supply stores, the Capital One® Spark® Cash for Business will be better for virtually all other uses. Therefore, we urge business owners to consider where their company tends to make the most purchases. Go over the types of vendors you work with and how they are categorized. If the 2x mile categories on the United℠ Explorer Business Card don’t capture most of your day-to-day transactions, the Capital One® Spark® Cash for Business will likely be the better choice for your business. One other thing to consider, just as we pointed out in the previous card comparison, is that you will miss out on all the airline-specific perks when you pass on the United℠ Explorer Business Card. Consider how much you value United Club℠ passes, priority boarding and free checked bag benefits. If you’re interested in comparing business credit cards based solely on rewards and bonuses, you can use our tool below. You can see how the United℠ Explorer Business Card compares to some of the top business cards. Click the gear icon to make changes to the default spending.